The last few years have witnessed sweeping changes in business environments. Advances in, and adoption of, technology has resulted in a significant shift of business operations towards the digital space. This has important implications for a wide range of models and functions--shared economy, cloud computing, digital marketing, and data science to name a few. In this context, it is hyper-relevant that management education undergoes commensurate changes. This conclave seeks to be a step towards the effective realization of such a change. 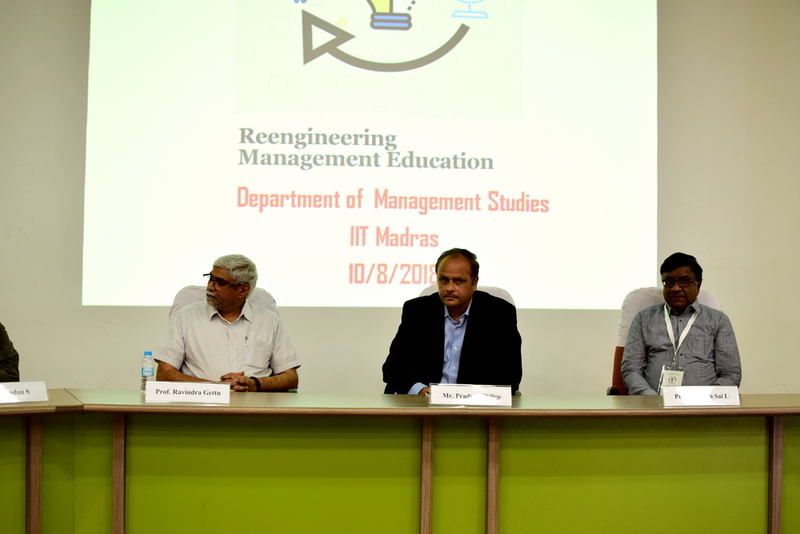 A panel discussion on ‘Shared Clarity: Future ready deployable talent in the digital era’ was moderated by Prof G. Arun Kumar, Department of Management Studies, IIT Madras. The panellists include Mr. Srinivas Ananthanarayanan, Head Human Resources, Saint Gobain Research India, Mr. Sudipto Mukherjee, MD & Head - Global Finance Services, Standard Chartered, Dr. Abhijit Phadnis, Director, Giltedge Financial Counsel Pvt. Ltd., and Dr. Anil Maddulapalli, Director, Customer & Credit Analytics, Ford Motor Company. Another panel discussion on the topic ‘Dilemma in the Digital Era: Re-engineer, Disrupt and Create’ was moderated by Prof R. P. Sundarraj, DoMS, IIT Madras. The Panelists include Mr. Varun Prakash, Engagement Manager, McKinsey Consulting, Mr. Santhanakrishnan, Vice President - Analytics Consulting, Tiger Analytics, and Mr. Venkat Paruchuri, Head of Information Security, Standard Chartered Bank.